"So you up to speed on what we need you to do?" 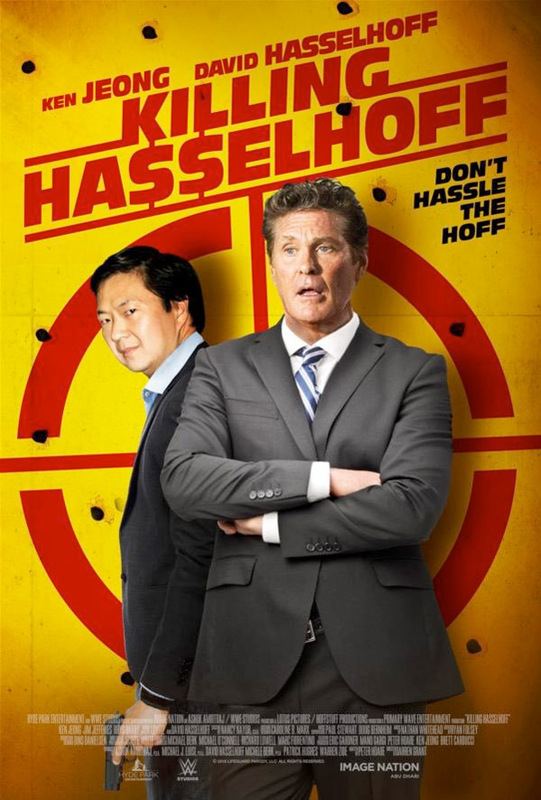 Universal has debuted the trailer for an indie comedy titled Killing Hasselhoff, which has also had informal titles previously including The Hangover Part 4 and Celebrity Death Pool. Ken Jeong plays a man who loses everything in a high stakes celebrity death pool, including his home and his wife and his business. He realizes the only way to get everything back is to actually kill his celebrity - David Hasselhoff. The ensemble cast includes Jim Jeffries, Rhys Darby, Will Sasso, Jennifer Ikeda, Ron Funches, Colton Dunn, Dan Bakkedahl, along with David Hasselhoff himself. This looks as awful as it sounds, and is headed straight-to-DVD if anyone is interested. See below. A man (Ken Jeong) in a high stakes celebrity death pool quickly loses everything - his business, his bank account, his home, his fiancé. He snaps, then realizes the only way to get his life back on track. He'll have to murder his own celebrity. He'll have to kill Hasselhoff. Killing Hasselhoff (also known as Celebrity Death Pool) is directed by filmmaker Darren Grant, of the films Diary of a Mad Black Woman, Make It Happen, and other various projects including episodes of "Saints & Sinners" previously. The screenplay is written by Peter Hoare. Universal Home Entertainment + WWE Studios will be releasing Killing Hasselhoff straight to DVD + on VOD starting August 29th later this summer. Is anyone interested in watching this?